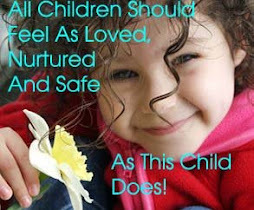 Love Our Children USA: College student tweets to end child abuse: what one person can do! Becca Jude of New Jersey is an 18 year-old college freshman at Miami University. And she’s not just any college student, she is one with passion, perseverance and commitment. During her senior year of high school she began researching child abuse. Her research led her to fully realize what a horrific epidemic child abuse is in today’s world. She had no idea how many kids were abused and how many die all over the world. That’s when she found Love Our Children USA. Being completely addicted to Twitter which her parents weren’t too happy about, Becca decided to create a twitter account to spread the word about how serious the issue of child abuse is and began to raise awareness. Her Twitter name is @st0pchildabuse. Last July, Love Our Children USA received an email from Becca saying she wanted to raise money and awareness for us on Twitter. She talked about it on her personal twitter page and spread the word. For the first few days she tweeted facts and statistics about child abuse and put up links to Love Our Children USA’s Website. After two days, she realized that there was more that she could do, because just tweeting about the problem was not enough. So she decided to donate 10 cents to Love Our Children USA for every follower that she gained until 2,500 followers, $250. Her goal of 2,500 followers seemed very far off and she didn’t know how long it would take, or if she would ever get there. A few days later, Justin Bieber’s mom, Pattie retweeted Becca’s tweet saying she wanted to follow and help spread the word. Becca was thrilled!! Thirty minutes later she gained over 250 followers. The following day Justin Beiber’s Road Manager and a member of his crew, Ryan Good retweeted Becca’s tweets. The account grew to 300 followers! Then Justin’s bodyguard followed, saying he loved the cause. If you are a Bieber fan on twitter any member of Justin’s crew noticing you is a huge deal and the fact that they noticed the account meant a lot to Becca and to Love Our Children USA! Suddenly the rapper Lil Twist followed. After that the followers just kept increasing and Becca was thrilled that people were supporting her and telling her that what she was doing was amazing and that she was a true inspiration. When Becca receives all of this kudos she’s not quite sure how to react. She doesn’t think she’s anyone’s hero – but she is to Love Our Children USA and many others! How many 18-year-old’s do you know who would donate money per tweet to a charity to stop child abuse? Not many! On September 18, 2010 Becca reached 2,500 followers and raised $250 for Love Our Children USA! That was an amazing day. She cried from happiness and shock! The icing on the cake was that the very next day Justin Bieber followed! That meant so much to Becca because she tells us she is possibly one of Justin Bieber’s biggest fans! In addition to raising more money and awareness for Love Our Children USA, Becca’s goal is to get Justin Bieber to tweet #st0pchildabsue to spread awareness. 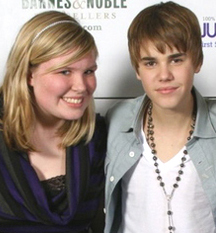 She feels Justin’s tweets could really help to make a difference about putting an end to child abuse. Becca feels that Justin’s tweets could help make it a Trending Topic which is much needed, since so many are afraid to talk about child abuse. Justin has thousands of supporters and raises a great deal of money for his pet charity Pencils of Promise. Becca hopes that somehow she can get him to support Love Our Children USA as well – because not only does the organization work to end violence against children, but they have an amazing signature program called STOMP Out Bullying. Other well know people who follow Becca @st0pchildabuse are Ellen DeGeneres, Jay Sean, Mandy Rain, Boyz_II_Men, Monique Coleman, Marlon Wayans and a retweet from Boyz II Men! To date almost 9,140 people follow Becca who donates 5 cents per follower to Love Our Children USA. Becca also donated to another child abuse prevention group until November 1st, and now is exclusively donating 5 cents per follower to Love Our Children USA. In addition to looking for celebrity followers, Becca is looking for corporate sponsors to help as well. She told us that she is so grateful for this account and this cause because it has truly changed her life. Everyone at Love Our Children USA is so grateful to Becca. Not only is she helping to raise money and awareness, but she is a role model as to what one person can do! There are many forms of child abuse, including bullying and cyber bullying. By educating parents, we can keep children safe from the very people who are supposed to be protecting them. Meeting with parents in New York and all over the country, many tell me that they wish there was something they could do to help. Well, here is a college student who is doing something! Ending child abuse begins with you! It begins with all of us! Just look at what Becca is doing! Kudos and gratitude to Becca Jude!